This past summer, I had a fantastic time working at Western Digital as a UX Design & Research Intern on the My Cloud Home team. The My Cloud Home is a hard drive that stays connected to a router at home, so that its contents can be accessed from anywhere using a desktop, laptop, or smartphone. 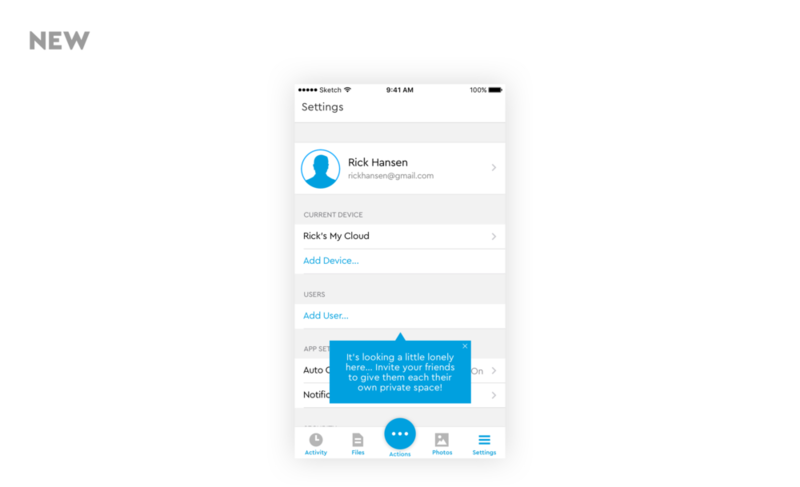 Using the mobile app, users can access, upload, and share their photos, videos, and documents on-the-go. 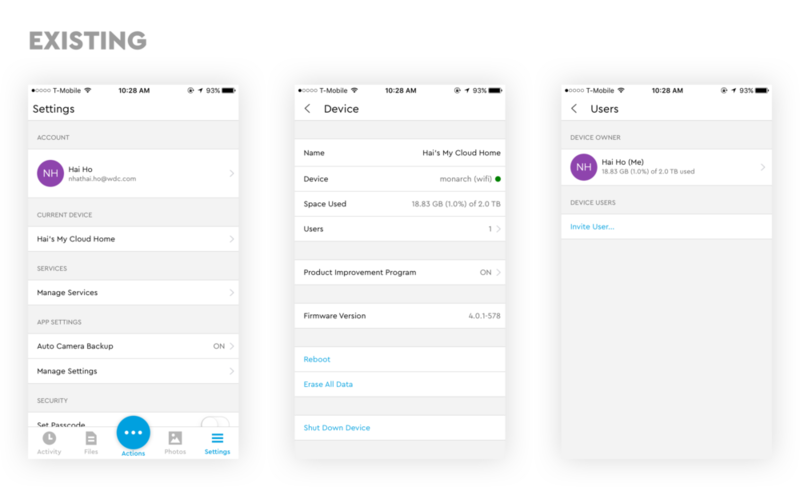 I worked closely with UX designers, product managers, engineers, marketers, and even executives to create a world-class user experience for the newest generation of the My Cloud Home mobile app. 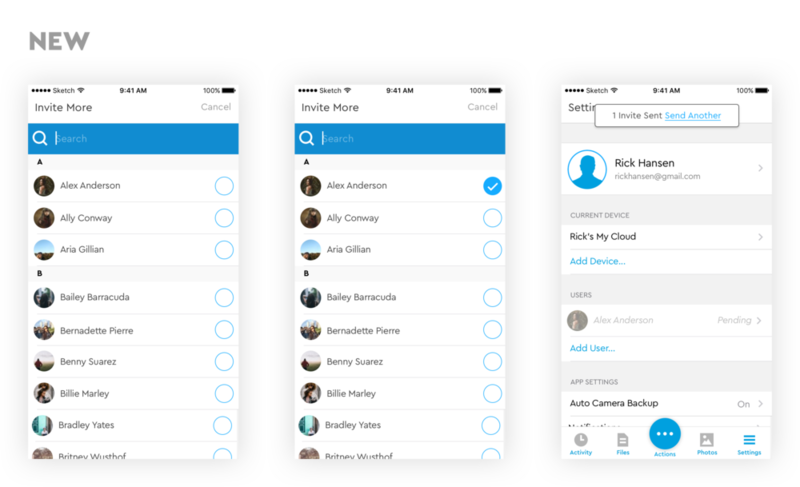 In the My Cloud Home app, people who own the device can add multiple users to the device. The admin and users of the device share the device's storage space, but their files remain private from one another. In other words, a user who was added to the device can upload photos but no other user, not even the admin, can view them. In past user tests, we found that the overwhelming majority of users did not know how to add more users to their device using the existing interface. If they did find it, it was through sheer luck or by tapping around aimlessly. Once they found out how to add users, none of them understood that each user's uploaded files remain private from other users on the device. My challenge was to make it easier for people to add users to their device and to educate them on how inviting works to instill a better representation of the mental model of this action. 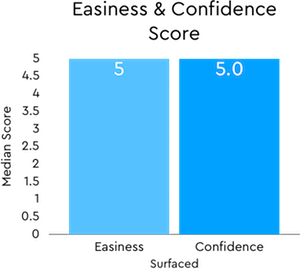 After presenting the ideas to my UX team and PM, we decided that idea #1 and #3 have the lowest overhead and potentially the most impact and therefore, are most likely to be implemented in the short period of time before we launch. My research consisted of 3 pairs of remote, unmoderated usability tests on UserTesting.com, each pair consisting of a control test and an experimental test. The control group for the third test consisted of a combination of the preceding four test sessions because those tests lacked a walkthrough explaining the procedure of inviting others. Each test consisted of 10 participants, making up 50 users in total. In these trials, I created a fictional scenario and asked users to invite another user to their device. The metric for success was whether or not the user invited another user to the device. Will more people invite others if we surface the Users section in Settings and provide a coachmark? In the new flow I designed, I moved the action of adding a user to the main Settings menu. Now, all owners need to do to add another user is go to Settings and tap Add User. They will also see a coachmark drawing more attention to the task we want to nudge them toward. To add users, the owner can look up emails associated with a contact, or they can enter emails manually. Both of these processes only allow inviting one user at a time, which may be too tedious and create friction in the flow. 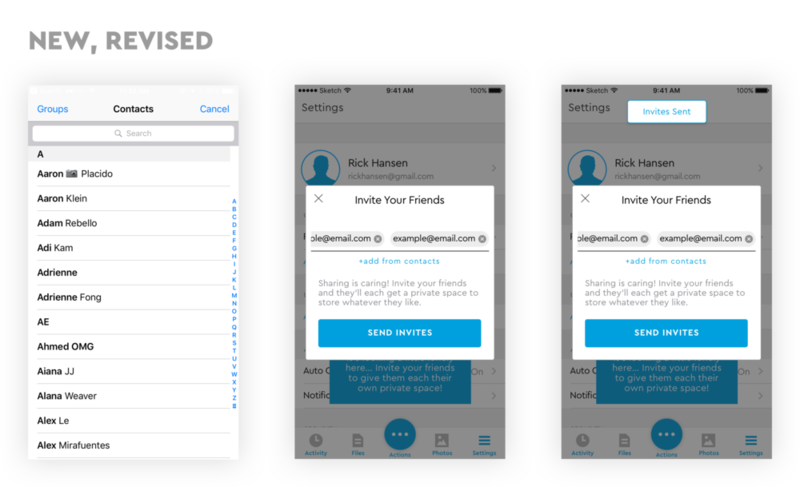 In the new flow, owners can invite multiple contacts at once, or they can manually enter several emails, sending multiple invitations at once. My goal with this was to make the process more efficient and easier than it currently is. Due to the quickly approaching deadline for our product launch, my PM advised me to leverage the existing UI rather than create new UI and assets. The lower the overhead for our engineers and developers, the more likely my suggestions will be implemented. Because of this, I created another iteration that more closely matches the existing interface while maintaining the crucial components that improved usability based on my research findings. Adding users to the device was still contained in the modal, but multiple contacts/emails can be added and invitations can be sent all at once. In the existing flow, users had a lot of trouble finding the action to add a user. It didn't occur to them nor did it make sense in their mind that this action would be under their current device. In other words, the action was too buried. 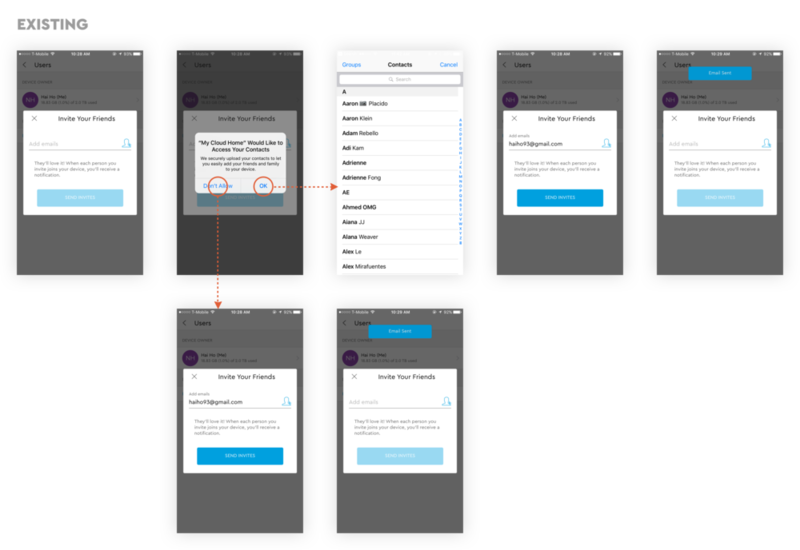 When I surfaced this action, 80% more users succeeded at the task of inviting someone to their device than when using the existing flow, with the buried action. 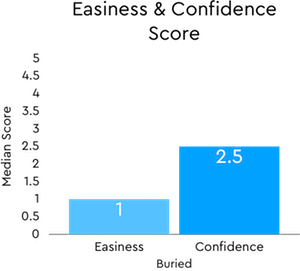 When using the new flow, users found the task 400% easier than those using the existing flow and they were 100% more confident that they had completed the task. In these trials, I let users roam and explore the interface without any prompts. The metric for success was whether or not the user invited another user to the device without being asked to do so by the study. Will more people invite others if there is a badge on one of the Activity cards? Currently, there is nothing in the Activity tab that calls attention to inviting users to the device. In the new flow, I simply added a badge to the Activity icon in the tab bar and on the corresponding Activity card. When using the new flow, 96% more users did not invite someone to their device than when using the existing flow. 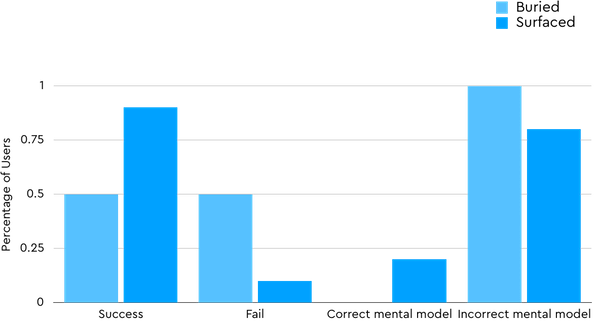 Similarly, participants’ ratings for ease of task and confidence of completion did not change across existing and new flows. Due to the small sample size and unnatural scenario, these findings are inconclusive and require further testing. The trials in this study were similar to those in the first study, where I created a fictional scenario and asked users to invite another user to their device. But in this study, users viewed a walkthrough that educated them on how it works. The metric for success was whether or not the user invited another user to the device. Will more people understand the mental model of inviting others to their device if we create layers of redundancy throughout the app? When users want to add another user their their device, they immediately receive a prompt to let us access their contacts, without any reason or context as to why we need it. Now, when users try to add another user, I take them through a brief walkthrough that clearly explains this process. It reassures them that when they add a user, all their files will remain private from all other users on the device and all files uploaded by other users will remain private to them. Then, I present the benefit of allowing us access to their contacts. There will always be users who breeze through interstitials or simply forget what they've only read once, so I added this information in the User Detail page to ensure people will understand how the process works even after they've viewed the walkthrough. 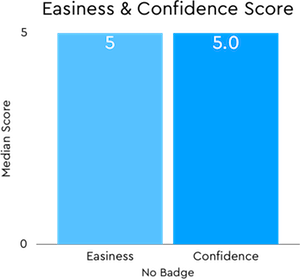 After viewing the walkthrough, 40% more users succeeded at the task of inviting someone to their device than when they did not. More importantly, a whopping 460% more users expressed an understanding of the mental model of inviting someone to their device. This walkthrough is primarily important for instilling the correct mental model in users' minds..
To the right are action items plotted inside an Effort-Impact matrix, with the lowest effort items located in the left half of the matrix and the highest impact items in the top half of the grid. Hence, items that fall inside the blue square should be prioritized because they require the least effort and have the highest impact. • Display a coachmark OR badge on an Activity card 48 hours after initial setup AND if no users have been added. 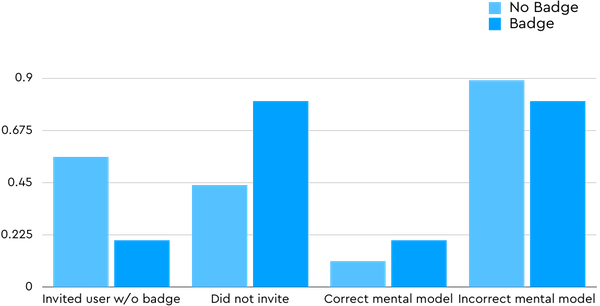 • Insights are uncertain without more data and A/B tests. This will be more feasible post-launch when we can run A/B tests on a large scale.